Joe and I started Friday off the day with a misty 25 minute walk. 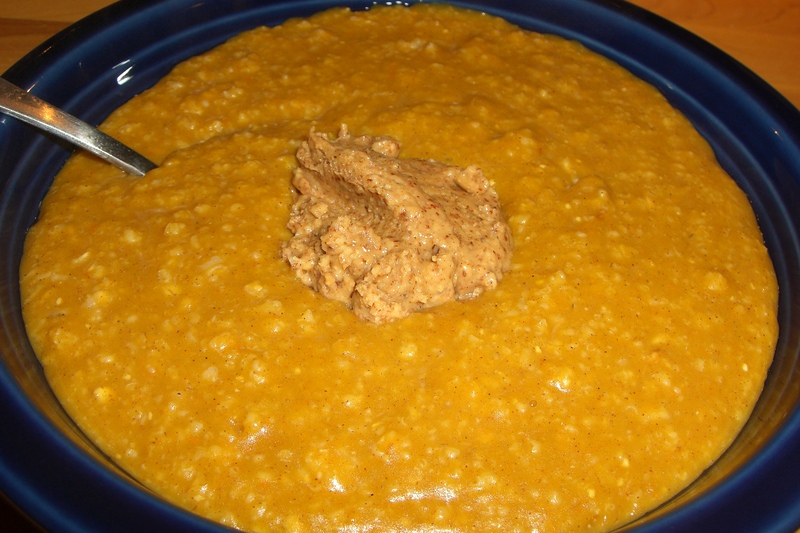 I treated myself to oat bran with pumpkin and almond butter for breakfast. I’m a big fan of oat bran. It reminds me of cream of wheat but it doesn’t take as much attention to make. I can finish getting ready while my breakfast cooks up in the kitchen. I only worked a half day today since I had plans to see New Moon with some friends. We split appetizers for lunch. After the movie I had a bunch of errands to run before I got home around 5:30. I ended up picking up a pizza for dinner, which I really don’t like to do. If I’m going to enjoy pizza I like to make my own from scratch, but I just didn’t have the time. Jacob’s parents were going to be over at 7pm for cider, dessert and a movie. 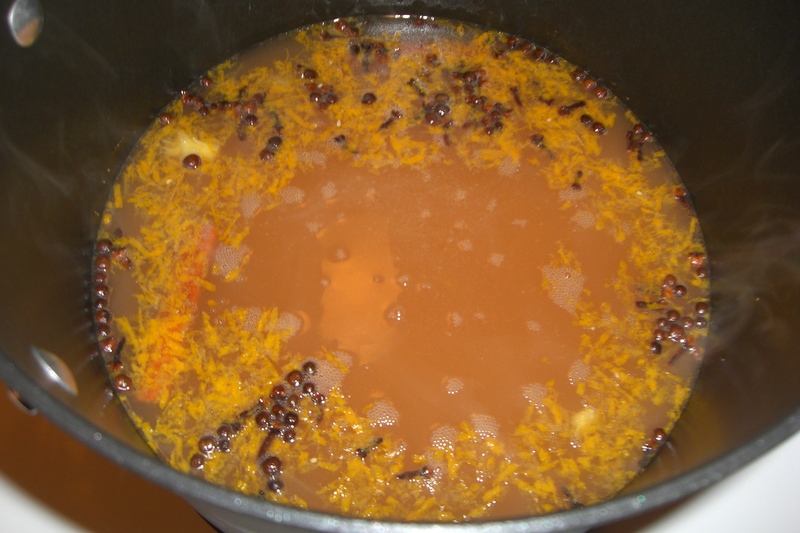 Jacob made the cider (apple juice, spices, orange zest + juice and mead). It made the whole house smell wonderful. Here it is simmering away on the stove. 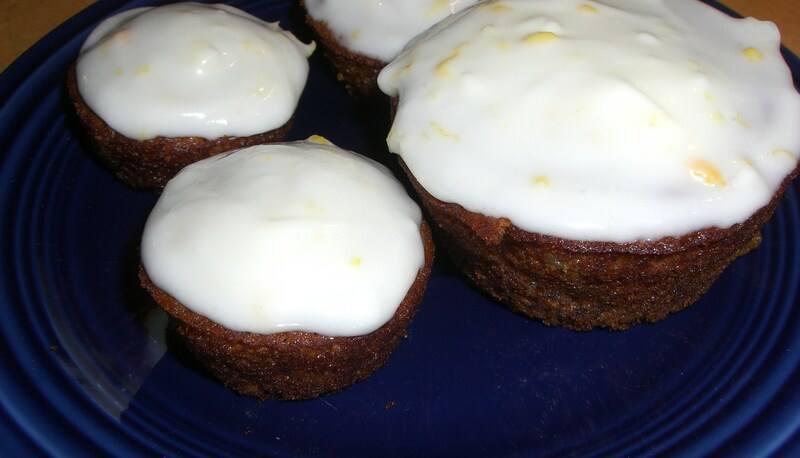 I baked up some Carrot Cupcakes with Citrus Cream Cheese Frosting Thursday night, but wasn’t able to make the frosting until when I got home. The recipe made 12 regular size and 12 mini cupcakes. The cake part was more muffin like, but once I added the frosting it was definitely a dessert. They were very tasty. Before our guests were over I made sure to complete my push ups for day 3 of week 1. I’ve added a total count for the week below the results for week 1. HOw long have you been a vegetarian,how do you get all the nutrition you need.would you recommend this way of eating for diabetes? Hi Sherrill, I'm not a vegetarian but I do enjoy vegetarian eats at times.